A bit dull without plants..
Hi Chezs, no, it go's in the shed, iv'e learned the hard way, having left garden furniture out before, the chairs stack and the table comes apart and the legs go inside the table top so its a flat pack, not too much storage room took up.. thanks for your comments everyone :) most appreciated..
Love your landscape design, The way you've incorporated the stone, wood, and turf, is very modern, and professional looking . ! You can come and design a garden for me anytime.! Awwww thanks Flcrazy, I love Modern, And Different textures shapes and colours, the same go,s for plants too...Dee.. Your garden is beautifully designed . Have enjoyed looking at all your photos. Awwww Thanks Peeps, Your comments are truely Appreciated :) Dee..
Hellooo Rammy, your a fella, :0. Cool...Dee..
Looks like a designer garden in a show! not dull, i love it. Very contemporary and clean looking. I love it! So many different textures. It's different - modern - clever - cool - and not a bit like mine! I don't think it would work with a 500 yer-old cottage, do you? LOL. WHAT A FANTASTIC BLEND YOU HAVE,DECKING,GRASS,SHILLIES,AND A LOVERLY PATH. LOOKS FANTASTIC,WELL DONE. Your garden look's about the same shape & size as mine. I'v got patio door's leading out to where your decking is & i was thinking of having decking too but the sun doesn't touch that area at all so i was thinking of having a small conservatory, what do you think? By the way, your garden is ace. Your garden is absolutely stonking Young DD!! I LOVE it!! 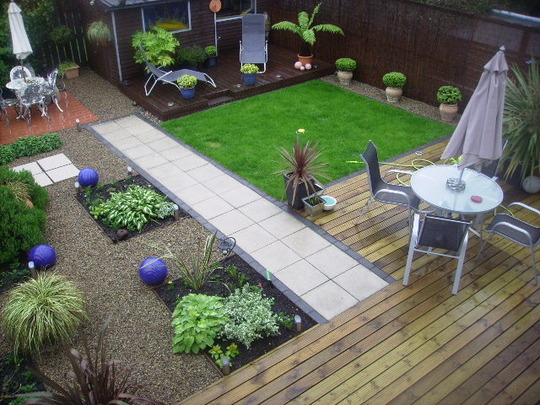 You`ve certainly got an eye for design this could be a Chelsea Garden its very well proportioned. Excellent Dee sometime since I have seen your garden finished .